Last week I first discussed the price of bitcoin when it hit $450 by comparing it to the Tulip Bulb mania of 1634. A few hours later the price blasted through the $900 mark and I compared it to the Mississippi bubble during the early 1700's. 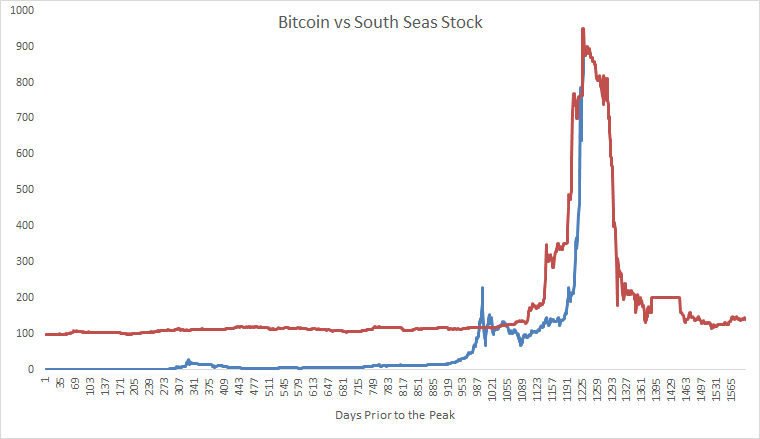 As bitcoin has not stopped to catch its breath and just a few days later has soared through $1,240, we can look at some fun charts comparing it to the South Sea bubble of 1720. 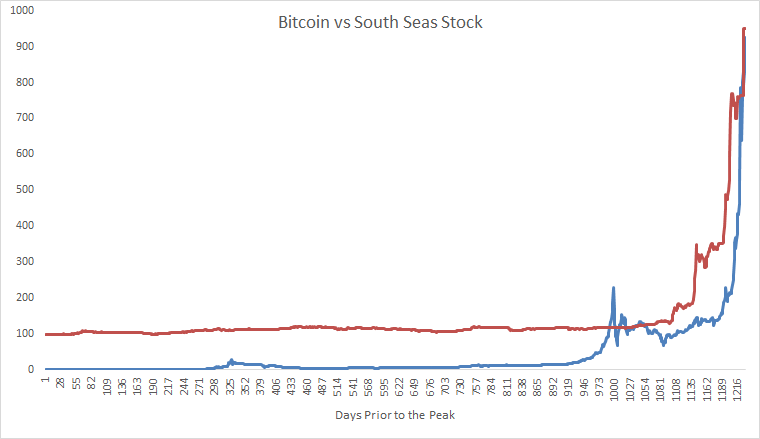 For those unfamiliar with the South Sea bubble, Wikipedia provides a good summary. 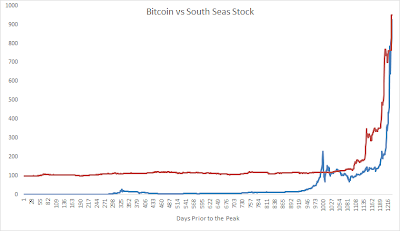 The following charts come from Mebane Faber, layering the bitcoin price (blue line) against the South Sea Company (red line) hundreds of years ago. You'll notice that because the chart is more than a few hours old it has bitcoin at $900. 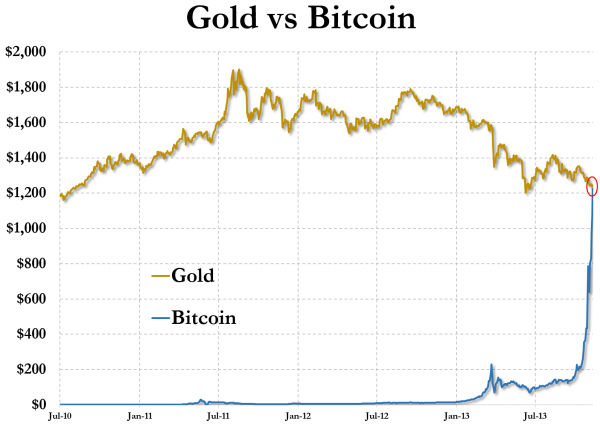 The price is moving higher at such an exponentially parabolic rate it makes charts like these dated quickly. You can visualize the blue line above blasting $340 higher (making it that much more absurd). 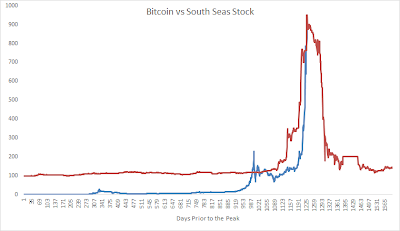 What followed next for the South Sea company (red line in the chart below) was the same experience seen in the Tulip Bulb mania and Mississippi bubble. A complete collapse. Last night the price of bitcoin hit a historic point when one bitcoin exceeded the price of one ounce of gold. Bitcoin will be held up by historians in the same regard as the famous bubbles discussed above. It is a true testament that while the world surrounding us can change dramatically over hundreds of years, human psychology and the subsequent madness of crowds will always be with us. You can track the action here at the Live Bitcoin Bubble Tracker.